We are the Sony Concert Band which is a corporate band belonging personnel affairs section of Sony Corp. All members are/were workers of Sony Corp. and some Sony group companies, as engineers, researchers, purchasers or accountants …etc. Of course, we all love music. Masaru Ibuka (1908-1997): Founder of Sony Corporation, loved music and he ordered to organize concert band in the company. 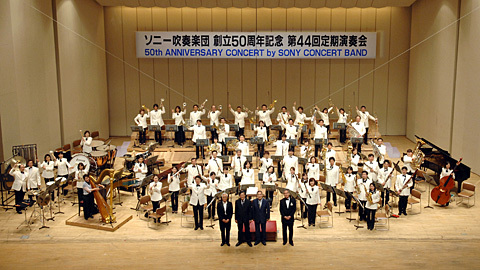 Finally Sony Concert Band was established in fall of 1957 and started their first rehearsal in January of 1958 with 25 members when the company changed new name from Tokyo Tsushin Kogyo Co. to SONY, it was exactly same time. After 1983, we visited many different prefectures to have concert for the schools and young students. In 1979 we celebrated ourselves 20th Anniversary, visited the United State in summer for TBA Convention which was held in San Antonio, Texas. In 1989 we had concert tour to Asian Area to celebrated our 30th Anniversary. And in 1998 we had the concert tour to the USA / Mexico for another celebration our 40th Anniversary. Mr. Akiyama retired the conductor of SCB in Spring, 2000. Then we invited to join Mr. Tsunanobu Kawamoto as a new Conductor / Musical Director. In past 50 years, we invited many guest conductors as follows; Frederick Fennell, Paul Yoder, Alfred Reed, James Barnes, Norio Ohga : Chairman/CEO of Sony Corp. etc.